hey can be grown in different types of soils; however, the soil must be well drained They are hardy in zones 4-9 A beautiful vine on it's own! The Hardy Arctic Kiwi is THE FRUIT OF THE FUTURE The 2 plants you will receive (Meader and Anna) are growing in 3" pots. Shipped dormant in the winter. he Hardy Arctic Kiwi is THE FRUIT OF THE FUTURE. Fruits are now being marketed and sold in produce stores. It has been accepted in the marketplace and the demand will be growing in the very near future for the small delicious fruits. The Hardy Kiwi, are native to the mountains and hills of southwestern China where they grow wild in trees and on bushes. The Hardy Kiwi was introduced to the United Kingdom, Europe, United States, and New Zealand between 1900 to 1910 from China. Commercial plantings were made in New Zealand about 1930 and have become widespread over the last 20-30 years. These plants have been tested in New Hampshire and upper New York State where they survived 25 degrees F below zero temperatures! Kiwi plants are attractive growers that require a sunny location, preferably with wind protection. They can be grown in different types of soils; however, the soil must be well drained. The vines take very little maintenance-just pruning and support to hold about 100 lbs. of fruit for a mature plant. Plant 10 to 20 ft. apart. They are hardy in zones 4-9. Kiwi plants are very pretty when used to cover a wall or fence or used in landscape design. The fruit is very high in Vitamin C and its use in recipes is endless. The hardy Kiwis ripen in mid to late September. Growing instructions included with each order. 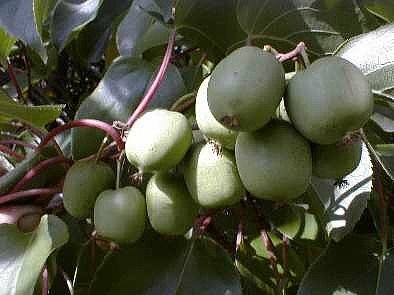 Two Hardy Kiwi Plants are necessary to get fruit, a male and female. Female Plant: Actinidia arguta 'Anna' (Ananasnaya). An outstandingly reliable bearer of relatively large fruit. The fruit is very sweet. A nurseryman from Tennessee, reports that in 1996 his large vine of 'Anna' bore over 200 lbs. of fruit. Imported into the U.S. from Belgium. Male Plant: Actinidia arguta 'Meader'. Use as a pollinator for female selections. A beautiful vine on it's own! The 2 plants you will receive are growing in 3" pots. One male plant can pollinate several female plants.